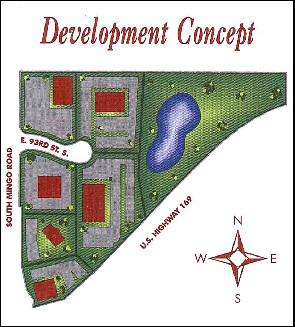 We purchased 40 acres of land in 1982 in the 93rd and Mingo area in Tulsa to hold for future development. The original tenant build out of the land was a golf training center with a driving range. 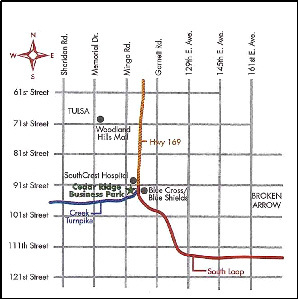 In the late 1990s, the Creek Nation Turnpike was developed, which included negotiations with the State of Oklahoma for acquisition of a portion of the undeveloped acreage being utilized for the driving range. Upon completion of the turnpike, the property was redeveloped into Cedar Ridge Business Park, consisting of six commercial lots designed for medical/office use. In addition, just over five acres were dedicated to the City of Tulsa for future park development. Contact us for leasing and development opportunities at Cedar Ridge Business Park. Another example of commercial / retail development is located at 101st and Delaware (aka Riverside Parkway) in Tulsa. Smitty’s Fiesta Mart™ opened in May of 2009. This site is comprised of a gas station, self-serve carwash bays, automatic tunnel carwash, and Smitty’s Coffee House.